The plaque can be viewed at the NTT Cyber Communications Laboratory Group, Yokosuka City, Kanagawa, Japan. The origin of the facsimile extends far back and its founding can be ascribed to the radical principle advanced by Alexander Bain in 1843. Thus it preceded by 30 years or more the invention of the telephone by Alexander Graham Bell in 1876. The growing reach of the telephone network sparked rapid technical advances in many fields except for the facsimile, which continued to be the 'sleeping giant' for many years. At first, only a few companies could afford facsimiles and each company bought paired sets to communicate with themselves; there was little demand for the cross-company connection of facsimiles. The early international standard on facsimiles, Group 1(G1), was issued in 1968 . However, there was little communication based on this standard. Released in 1976 , the G2 facsimile (the so-called "three minute facsimile") was the breakthrough needed to stimulate the interconnection of facsimiles. The larger market sparked by the standard lead to a proliferation in the models available and a steady fall in prices. More people were sending facsimile messages and they hated waiting for each page to send. More advanced standards became the goal of international and domestic research activities. In CCITT (International Consultative Committee for Telegraph and Telephone), international standards for securing facsimile intercommunication had been under discussion for some time. In Japan, the driving force was The Ministry of Posts and Telecommunications (now Ministry of Public Management, Home Affairs, Posts and Telecommunications). The G2 facsimile [Recommendation T.3 (standardization of G2 facsimile for the document transmission)] represented the speed-enhanced analog facsimile. In 1972, the telephone facsimile service attracted attention as an office communications tool for corporate customers. Its spread advanced new types of business communication in which drawings and images such as architects' plans and proposals were transferred between parties. Both G1 and G2 facsimiles were dropped as recommendations in 1996 with the rapid adoption of the digital G3 facsimile standard. G3 facsimile realized the one-minute facsimile by adopting the MR method, the most advanced two-dimensional encoding method developed through the collaboration of NTT and KDDI. It enabled the intercommunication of all facsimiles throughout the world. The rapid standardization precluded the market from being flooded with proprietary systems, while ensuring the freedom needed to compete with additional features and reduced cost. The rapid penetration of G3 facsimile proved these achievements. 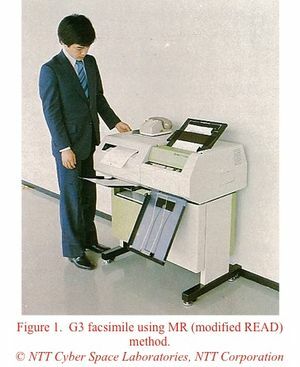 The G3 facsimile (the "one-minute facsimile") was recommended as 'Redundancy suppressive digital facsimile' in 1980 . At this time, Japan took the lead, and two-dimensional coding was examined by CCITT as the basic facsimile redundancy reduction method. Joint proposals were made by KDD (Kokusai Denshin Denwa Co., Ltd., now KDDI) and Nippon Telegraph and Telephone Public Corporation (now Nippon Telegraph and Telephone Corporation or NTT) -. Of particular import was the release of digital facsimile equipment that used the MR method, which offered twice the compression performance of the standard coding method (MH coding) at that time. The biggest issue was the related intellectual rights, but this was resolved when the Japanese delegates declared at the Kyoto meeting of CCITT that if the MR method was adopted as the international standard, the patents and property rights would be offered free of charge. Most pending issues were completely settled by this offer from the Japanese delegates, and the Kyoto meeting of CCITT finished smoothly as a result. Reaching agreement on this recommendation was a strongly held goal of Japan. The two-dimensional coding MR (Modified READ) method was adopted as the basis for an international standard (ITU-T recommendation T.4) in 1980 . Typical G3 facsimile equipment of that time is shown in Fig. 1. In addition, the part of the CCITT recommendation that describes Modified READ is shown in Fig. 2 . The rapid standardization precluded the market from being flooded with proprietary systems, while ensuring the freedom needed to compete on additional features and reduced cost. The rapid penetration of G3 facsimile validated these achievements -. In 1981, NTT began the Facsimile Communications Network (F-Net) Service, making facsimile an essential service for business -. The MR method was extended to yield the MMR method; it was adopted as ITU-T recommendation T.6 in 1984 and is the coding method of the current G4 facsimile . This recommendation was issued for "For telematique equipment and ISDN (Integrated Service Digital Network)." The MMR method is still used to realize high-speed facsimile communication. The opening of the communication infrastructure by the law change in Japan and timely international standardization activities played major roles in the rapid spread of the facsimile in Japan. The performance gains and price cuts offered were further advanced by this spread, and worldwide adoption followed soon after. Standards were revised to allow personal computers to send and receive facsimiles . CCITT (ITU-T): Recommendation T.2, G1 facsimile, White Book Vol. I, VII - Forth Plenary Assembly - Mar del Plata, 1968. CCITT (ITU-T): Recommendation T.3, G2 facsimile, Orange Book Vol. I - Sixth Plenary Assembly - Genova, 1976. CCITT (ITU-T): Recommendation T.4, G3 facsimile, Yellow Book Vol. I, VII. 2 - Seventh Plenary Assembly - Genova, 1980. CCITT (ITU-T): Recommendation T.6, G4 facsimile, Red Book Vol. I VII. 3 - Eighth Plenary Assembly - Malaga - Torremolinos, 1984. Y. Yamazaki, Y. Wakahara and H. Taramura, "Digital Facsimile Equipment ‘Quick-FAX’ Using a New Redundancy Reduction Technique," in Conf. Rec. 1976 Nat. Telemetry Conf. pp. 6.2.1-6.2.5, Nov. 29 - Dec. 1 (1976). Tomomichi Yamada, "Edge-Difference Coding-A New, Efficient Redundancy Reduction Technique for Facsimile Signals," IEEE Trans. Commun., Vol. COM-27, No. 8, Aug. 1979. 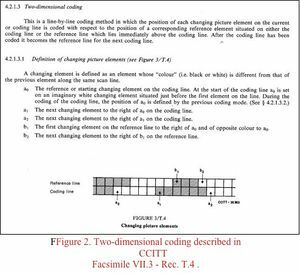 Yamada T., Yuki K., Yamazaki Y., Wakahara Y., "Relative Element Address Designate (READ) Coding Scheme for Facsimile Signals," Journal of The Institute of Image Electronics Engineers of Japan, vol. 8, No. 4, pp.265-275 ( December 1979 ) . M. Orii et al., "Mini-Fax-A trial small size facsimile," Japan Telecommun. Rev. 19, no. 3, pp. 209-216, July 1977. M. Orii et al., "A new model small size facsimile-Mini-fax," Japan Telecommun. Rev., 21, no. 3, pp. 218-224, July 1979. Yasuda, Y., Yamazaki, Y., Kamae, T., Kobayashi, K.," Advances in FAX," Proceedings of the IEEE 73, No. 4, April 1985. N. Kobayashi, T. Kamae, "A New Nationwide Network for Public Facsimile Communication," Japan Telecommun. Rev. 20, no. 4, pp. 276-281, Oct. 1978. T. Kamae et al., "Experiments on Facsimile Intelligent Communication System FICS-0," Rev. Electrical Commun. Lab. (NTT) (ECL Rev. ), vol. 28, nos. 9-10, pp. 773-782, Sept. 1980. H. Hase et al., "An Outline of the Public Facsimile Communication System," Japan Telecommun. Rev., vol. 22, no. 4, pp. 315-326, 1980. T. Kamae et al., "Facsimile Intelligent Communication System FICS-1." ECL Rev. 29, nos. 7-8, pp. 649-662, July 1981. K. Yuki et al., "Construction of Facsimile Storage and Conversion Equipment (STOC) for FICS-1 system," ECL Rev. 29, nos. 7-8, pp. 693-702, July 1981. "INS: Tomorrow’s Integrated Technology, Information Network System The Dawning of a New Age," NTT Report, 1989. H. Takada et al., "FICS-1 switching system," ECL Rev. 29, nos. 7-8, pp. 663-679, July 1981. T. Ohmori et al., "Facsimile intelligent communication system, present and future," ECL Rev. 31, no. 4, pp. 463-466, July 1983. K. Yuki et al., "Facsimile intelligent communication system (FICS-2) outline," ECL Rev., vol. 31, no. 4, pp. 467-474, July 1983. Kaoru Wakabayashi, "Research and Events that Permitted Facsimile Use to Explode in Japan," IEEE Global Communications Conference Exhibition & Industry Forum (GLOBCOM 2009), December 2009. This page was last edited on 27 January 2016, at 18:09.